Formatting a transcript or anonymising a transcript (replace all references to the informants real name with an alias). The Find and Replace dialog appears. See Figure 1. You can then chose if you you search for the next time the word occurs by clicking on Find Next button. Or find all occurrences of that word by ticking the Highlight all items found in: box and then select from the drop down menu below whether you want to search the whole document or a selected area. 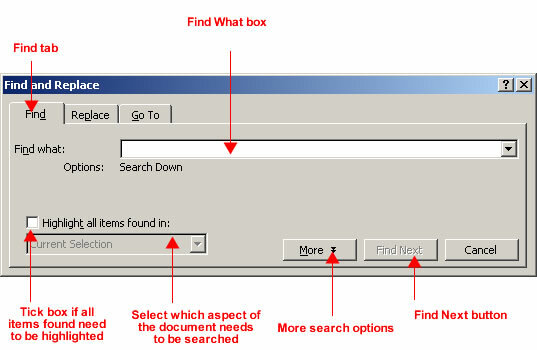 The More button provides further search alternatives such as match case or find whole words only. Type in the text you are searching for in the Find what: box and the text you want to replace it with in the Replace with: box. 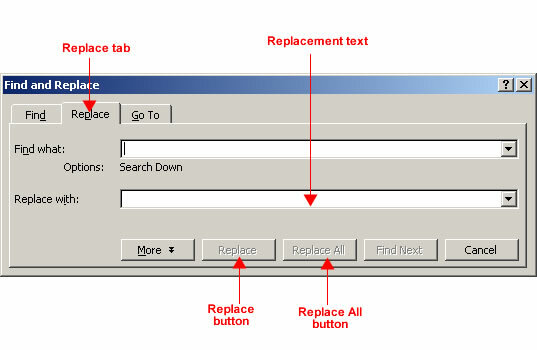 To chose replace each occurring text one by one click Find Next: button and then the click Replace button. Or you can do find and replace all occurrences automatically, click Replace All button.